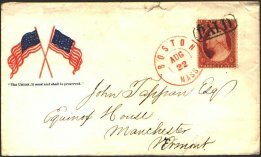 4/18/19: New items added to 1861-67 Issues, Stamps and Covers, and Destination Covers, new discounts available. See New Items page for more details. 4/9/19: New items added to Department Officials and Stationery and Cards, new discounts available. 3/26/19: New items added to Banknote Stamps, Banknote Covers, NYFM Cancellations, Destination Covers, Postage Dues, and Stationery and Cards, new discounts available. Welcome to The Classic Cancel! The items that you will find on this site are not my entire stock. I sell most of my merchandise through direct and regular email offerings to customers. If you like what you find here, I encourage you to contact me with with email address and collecting interests so that I may add you to my mailing list. You will then have the earliest opportunity to acquire the best items. Direct access to any individual page within a category is available through the New Items page, where you can easily locate recently updated pages. Additionally, you may perform word searches against the content of The Classic Cancel. Just click Site Search [currently disabled] to link to the search page. All items are priced net (see Terms of Sale regarding postage, handling and insurance) and are offered subject to prior sale. Items will be sold in the order that customer email requests are received. Items no longer available will be labeled SOLD. To order from the site, click Send eMail on any page. Please indicate in your message the item numbers of the stamps and covers that you wish to order. I will contact you regarding availability, payment and shipping. Feel free to ask me any questions about items or to provide comments regarding the site. I strive for accurate and complete descriptions and welcome your input. My entire stock is not displayed on these pages, so inquiries are encouraged. I also maintain records of customer interests to better serve your collecting needs. I will be continually updating this site as New Items arrive. So, check back frequently. Something of interest is sure to show up! Have a look around, stay a while and enjoy.